Stable material PLASTIC PATCH is a compressible refractory joint filler, developed for Anode Baking Furnaces, to protect expansion gaps against clogging with packing coke during heat up and operation, and prevent the distortion of flue-walls during thermal cycling. Developed by CIR Laboratory Canada (www.cirlaboratory.com ), PLASTIC PATCH is available worldwide from INSERTEC Furnaces and Refractories (www.insertec.biz). Packing coke plays an essential process role in anode baking. However, the infiltration of its finer grains into expansion gaps, particularly those between flue- and end-walls, quickly leads to clogging, increased maintenance cleaning, even flue-wall distortion and eventually increased refractory repair costs. Poorly mortared brick joints, exposed during heat up, also suffer similar infiltration and clogging problems. PLASTIC PATCH provides a stable and permanent solution to coke grains infiltration. Made from exfoliated vermiculite and fine-grain anhydrous aluminosilicate, and suitable for applications up to 1350c, PLASTIC PATCH adapts to these thermal expansion forces, by maintaining a glassy-phase during heat-up, allowing it to compress under thermal expansion, then heat-set to a hardened finish (1.2g/cm³ at 1200c) to maintain a tight seal. Unlike conventional ceramic fibre or mortar options, PLASTIC PATCH does not shrink (<2%), or become brittle at temperature, and therefore does not need to be replaced at the end of each cell firing cycle. Occasional light repairs, if necessary, can be skimmed directly onto existing clean product. Both ways, downtime is minimised, and furnace availability is improved. PLASTIC PATCH is supplied premixed, in cartons, ready for use. If additional flow is needed, up to 5% water can be added. In tight working spaces, its brownish-grey colour allows filled gaps and joints to be easily identified against refractory brickwork. Initial set is after 15 minutes, at +5°c. For larger areas, application can be by pump, or trowel. Finer joints and gaps can be hand-packed as required. Tools can be quickly cleaned with warm water. PLASTIC PATCH is non-corrosive, and does not contain irritants, known physical hazards or carcinogens, however wearing PPE is recommended. Storage should be for up to 12 months. For the best results on new or larger gaps; PATCH GRIP, LIQUID ANCHOR and SOLID ANCHOR, also from CIR/INSERTEC, are additional products that can be used with PLASTIC PATCH. The IDEX® is designed to give maximum flexibility together with minimum fuel consumption and emissions. It is an indirectly fired rotary kiln for thermal delacquering / drying that removes volatile organic compounds (VOC), such as water coolants, paints, oils, … from the surface of crushed aluminium materials. 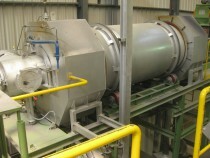 The system is completed with a postcombustion chamber for the incineration of the hazardous gases generated during the drying/decoating process. Hot exhausted gases are recirculated to the rotary kiln to eliminate the VOC, without any additional energy supply and so reducing the overall thermal consumption to the minimum. Final exhausted gases to the atmosphere are innert and comply with the most strict EU enviromental regulations. It is compact system where the postcombustion and drying chamber are in the same rotary kiln. 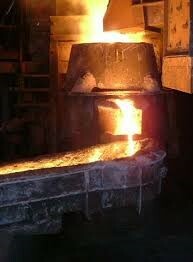 Increase metal yield during melting. Safer melting process, no water. Low Salt / flux usage on melting. Firing VOC pollutants reduce overall fuel consumption. Reduce emissions, waste gas controls.